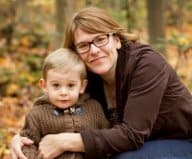 I am thrilled to be here on Meaningful Mama today to tell you about a really fun activity that I did at home recently with my 4 year old son and a playmate. Both boys are heading to kindergarten in September, and they’re working on learning their letter sounds. This alphabet phonics hunt was the perfect indoor playdate activity – and it could easily be adapted in difficulty for kids aged 3 to 10. Print and cut out the letters and laminate them if you wish for durability (I just used contact paper from the dollar store). Using the Hiding Spots Ideas sheet for inspiration, place or tape each letter on something in your house which begins with that sound. Make notes for yourself of where you hide each one so you don’t forget – like I did! 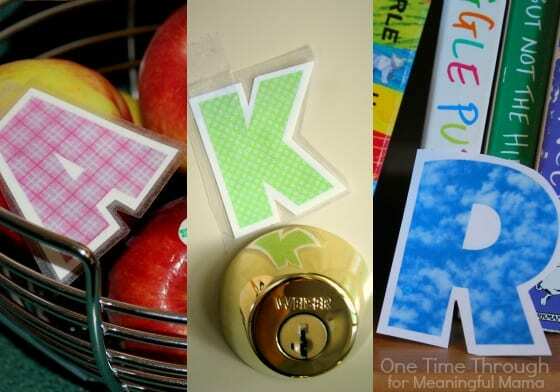 For example, in the picture below, I put the A in a basket of apples on our counter, K by the front door keyhole, and R by the bookshelf where we read! Now you’re ready! 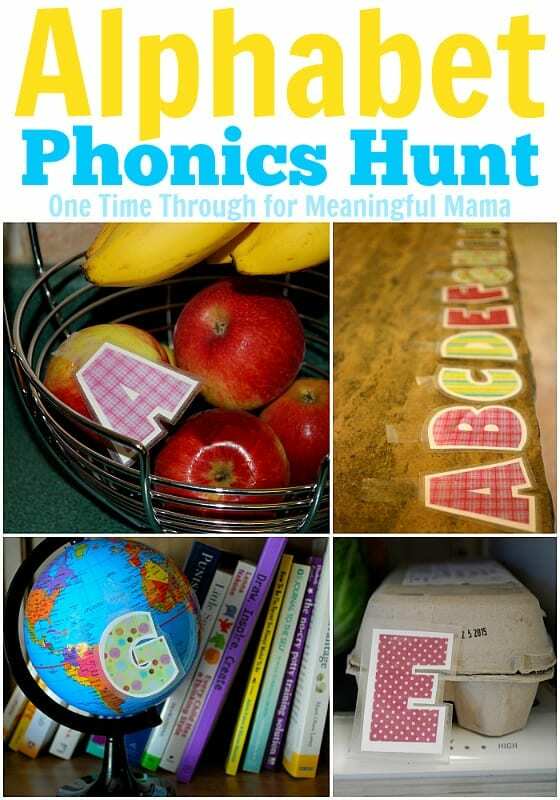 Explain to your child that they’re going to go on an alphabet sound hunt around the house. Tell them you have hidden all the letters of the alphabet beside things that start with their sounds. 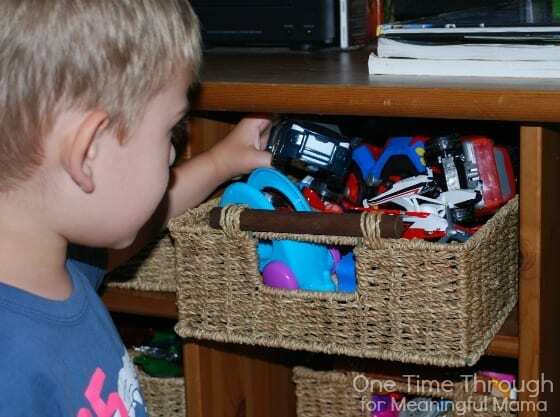 For older children, you could hide the letters by objects that end with the letter sound. We planned our hunt for a playdate activity and my son was so excited he could hardly wait for his friend to come over! I explained to the boys that we were going to find the letters in alphabetic order and that when we found each one, we would place them in order on a large flat surface (we used the fireplace). As the boys were looking, it was really interesting to hear them predicting where the letters might be. They came up with all kinds of ideas that I hadn’t thought of! When they found each letter, we returned to our fireplace to add it to our alphabet. The boys had SO MUCH FUN with this alphabet phonics hunt – much more fun than I expected! They seemed to love the combination of a hunt, with the challenge of trying to find the mystery words. My favourite part of the game was that it allowed the boys to create memorable mental connections between the letters and their sounds using everyday objects. It was a wonderful cooperative activity because the boys got lots of practise taking turns and helping each other, but it could also be done with just one child. I hope you’ll give this alphabet phonics hunt a try! If you’re looking for another hands-on letter sound learning activity you can do at home, be sure to check out our DIY Phonics Game. Or check out Meaningful Mama’s Textured Letters craft to try after this activity! Sue is a mom, teacher and librarian. You can find her blogging about hands-on learning activities and positive parenting strategies at One Time Through.com. She is also on Facebook, Twitter, Pinterest and Google+. Thank you, Sue, for writing for my readers today. I love this idea, and I’m excited to print these letters out and do them with my own preschoolers. Thanks for sharing your talents here. This is really a cute idea! I have a preschool-aged boy who I know would love this! So glad you love it, Karyn. It was so fun to have Sue guest post. I’m totally going to do this with my son too. Thank you so much for posting for me. I am going to do this with my son. He’ll love it. I really love what you do, and I’m so glad I had a chance to expose my readers to your work.